Comet ISON Is No More, NASA Says : The Two-Way There were hopes over the weekend that ISON might have survived its close encounter with the sun. But "with more than a little sadness," the space agency says, "we have to declare the comet lost." 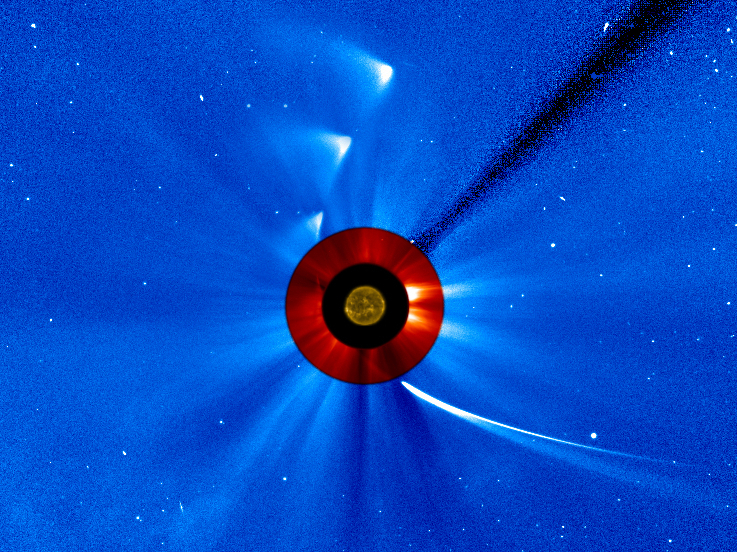 NASA took a series of images to create this "timelapse" view of comet ISON's trip around the sun. Comet ISON, a "shining green candle in the solar wind," is no longer with us, NASA declared Monday morning in a tribute to what many hoped would be the "comet of the century." On NASA's Comet ISON Observing Campaign website, astrophysicist Karl Battams writes that ISON was "born 4.5 billion BC, fragmented Nov. 28, 2013 (age 4.5 billion yrs old)." "Born in a dusty and turbulent environment, comet ISON spent its early years being jostled and struck by siblings both large and small. Surviving a particularly violent first few million years, ISON retreated to the Oort Cloud, where it maintained a largely reclusive existence for nearly four billion years. But around 3-million B.C., a chance encounter with a passing star coerced ISON into undertaking a pioneering career as a Sungrazer. On September 21, 2012, ISON made itself known to us, and allowed us to catalog the most extraordinary part of its spectacular vocational calling. "Never one to follow convention, ISON lived a dynamic and unpredictable life, alternating between periods of quiet reflection and violent outburst. However, its toughened exterior belied a complex and delicate inner working that only now we are just beginning to understand. In late 2013, Comet ISON demonstrated not only its true beauty but a surprising turn of speed as it reached its career defining moment in the inner solar system. Tragically, on November 28, 2013, ISON's tenacious ambition outweighed its ability, and our shining green candle in the solar wind began to burn out. "Survived by approximately several trillion siblings, Comet ISON leaves behind an unprecedented legacy for astronomers, and the eternal gratitude of an enthralled global audience. In ISON's memory, donations are encouraged to your local astronomy club, observatory or charity that supports STEM and science outreach programs for children." Battams has posted a more technical explanation here. He writes there that "while it is conceivable that small chunks of ISON's nucleus still exist, that possibility looks increasingly unlikely and it is with more than a little sadness that we have to declare the comet lost." As we posted over the weekend, the initial word after ISON's close fly-by of the sun on Thanksgiving Day was that it likely didn't survive the encounter. Then there was more hopeful talk that it just might have held together. Now, NASA has given up that hope. The space agency late Monday afternoon posted a video of "Comet ISON's Full Perihelion Pass." "The question remains as to whether the bright spot seen moving away from the sun was simply debris, or whether a small nucleus of the original ball of ice was still there. Regardless, it is likely that it is now only dust."